Will this be your WP8 weapon of choice? The first pre-order page for the Samsung Ativ S has popped up in the UK, with the online retailer asking for £479.99 (around $770/AU$750) in return for the Korean firm's flagship Windows Phone 8 smartphone. Update: Handtec has just amended its pricing for the Samsung Ativ S, with its pre-order page now saying £431.99 (around $700/AU$675) - making it a more attractive proposition. Thanks to tfawcett for pointing this out! 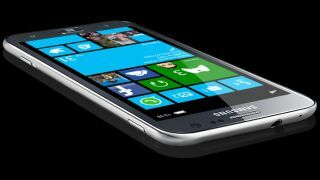 Unveiled at IFA 2012 in Berlin, the Ativ S joins the likes of the HTC Windows Phone 8X and Nokia Lumia 920 at the top of Microsoft's new pile of handsets. Online retailer Handtec has the Ativ S listed on its site for pre-order, and as well as being upfront about the potential price of Samsung's handset, it also reckons stock will arrive in the first week of November. Now that's a pretty safe bet, as we expect all the Windows Phone 8 smartphones to go on sale around this time, but back to that £431.99 price tag – is it worth it? Well for your money you'll be getting a huge 4.8-inch, 720p Super AMOLED HD – which is the same size as you find on the Samsung Galaxy S3. Under the hood you'll find a 1.5GHz dual-core processor, 1GB of RAM, 16GB of internal storage plus a couple of cameras - an 8MP offering round the back, while the front sports a 2MP sensor. So while the Samsung Ativ S is by no means cheap, it's pretty much the Windows Phone 8 equivalent to the Android-toting Galaxy S3 - so perhaps the claimed price is not all that shocking.